Everyone’s scrambling to upgrade their gear now that Forsaken has hit shelves, and the levitating Dusklight Shards are one of those resources you’ll want to gather. But where do you find them? These floating chunks of magic rock are found exclusively in the European Dead Zone. Leftovers from the Traveler’s battle with the Darkness, they’re scattered individually throughout the area (in fact, you can see page two of this guide for details on where). However, scooping them up as you wander isn’t the only way of getting Shards. Instead, a more lucrative method would be seeing tea aficionado Devrim Kay in Trostland. He provides daily Bounties that offer 10 Shards apiece for menial tasks like killing a certain number of foes. Just remember that you’ve got to finish them sharpish – they expire after 24 hours. Once you’ve accepted each Bounty, pick up a simple kill-and-collect patrol. Represented by the white triangle when you pull out your Ghost, these provide 2 Dusklight Shards upon completion for minimal effort. More importantly, you can always finish them while doing other things. Speaking of which, your next stop is the nearest Public Event. The reason’s simple; you’ll usually be able to complete that Patrol and those Bounties in the process. Better still, completing a Public Event nets you 2 more Shards each time. Repeat the process for a tidy little profit. Between Public Events, make sure you’re looking out for loot chests as well. These spawn at random across the European Dead Zone and provide 2 more Dusklight Shards each. 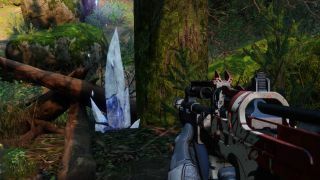 Handily, using the EDZ Ghost shell you received during Destiny 2’s campaign will show you where they are when you’re close enough. If you pick these up along the way, you’re onto a winner – there are a lot of chests out there. Meanwhile, make sure you seek out Region Chest if you’re new to Destiny 2. These are hidden throughout the map (represented by a cross on the Director) and offer 6 Shards a time. The same is true of Lost Sectors. These hidden mini-dungeons can be found near the mysterious semi-circle patterns painted on the environment. The chest located within – guarded by tough enemies, no less – will provide another 4 Shards. There are an abundance of Lost Sectors within the European Dead Zone, so it’s definitely worth a look. Of course, another method would be heading to Forsaken’s Tangled Shore and the Spider. He sometimes sells Dusklight Shards, albeit at a price and availability that varies from day to day.